Healthy Communities Collaborative Chair Cailean Kok, AICP, discusses why elected officials and planners should use this set of policies to promote and build healthy communities. Use the summary to share new policy ideas at-a-glance with colleagues and elected officials. Use these APA Planning and Community Health Center resources to assess, monitor, and report progress toward healthy planning goals. Planners are collaborators and conveners. 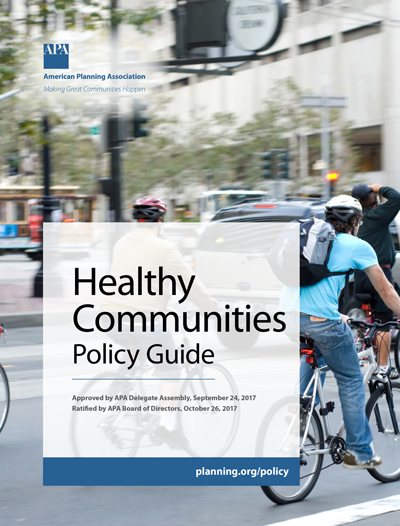 Through APA's Plan4Health initiative, communities nationwide are already working with key stakeholders to integrate health in all planning. This guide was approved by the APA Delegate Assembly on September 24, 2017, and ratified by the APA Board of Directors on October 26, 2017.